1. It doesn’t call for any exotic ingredients, so you should be able to make it with what’s on hand. 3. You can easily swap out different vegetables according to what you have in the fridge. Instead of (or in addition to) the cabbage, you could use broccoli, snow peas, green beans, etc. If you have leftover steamed veggies, this is a great way to use them. 4. 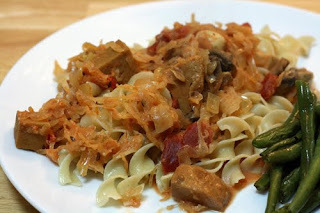 The recipe makes about 4 servings, but can be easily stretched by adding extra noodles or veggies, in which case you’ll want to double the sauce ingredients so there’s enough to coat everything. 5. Instead of tofu, you could instead add seitan or tempeh — or leave them all out in favor of more vegetables. MORE WAYS TO WIN: There are two more opportunities to win a copy of Vegan on the Cheap. 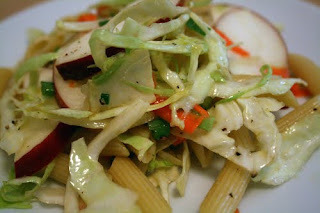 The first is at Savvy Abby, the new VegNews blog with money-saving tips (where I did some guest posting this week). Here’s the link to the giveaway where you will also find some of my Cheap tips and recipes. For yet another chance to win a copy of the book (and see another recipe), visit PETAPrime. 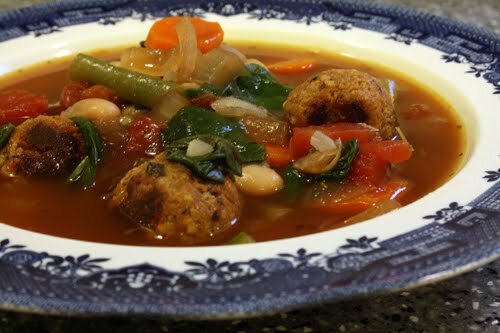 Recipe from Vegan on the Cheap by Robin Robertson © 2010, John Wiley and Sons. 1. Cut the tofu into 1/2-inch dice. Toss with the cornstarch and 1/4 teaspoon of salt and set aside. 2. Heat 1 tablespoon of the oil in a large skillet over medium-high heat. Add the tofu and cook until golden brown all over, about 7 minutes. Remove from the skillet and set aside. 3. Add the remaining oil to the same skillet over medium-high heat. Add the garlic, ginger, carrot, scallions, cabbage, and mushrooms. Season with salt and stir-fry to soften, 4 to 5 minutes. 4. 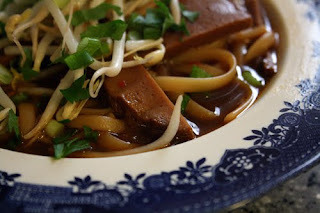 Stir in the soy sauce, rice vinegar, ketchup, and sesame oil. Add the reserved tofu and the cooked noodles. Toss to combine, adding a bit of water (or extra sauce) if the mixture is too dry. Taste and adjust the seasonings. Serve hot. 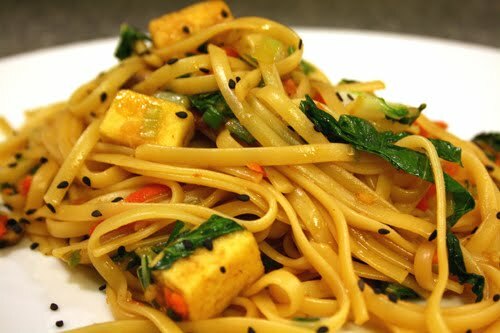 Note: Enjoy as is, or garnish with regular toasted or black sesame seeds or chopped parsley or cilantro. For a spicy version, add a drizzle of sriracha. Here’s the final installment of my favorite tester photos for Vegan on the Cheap. These lovely pics were taken by Tami at Vegan Appetite. That's Quick LoMein in the top photo. To see more great VOTC photos taken by Tami, visit her blog, Vegan Appetite. You’ll want to go to her blog for another reason too: she’s currently doing a great giveaway of Vegan on the Cheap. For your chance to win, just leave a comment on her post with your favorite money-saving tip. And while you’re there, read the other tips that are posted — lots of great ideas!! Now to my question. I’d like to share another recipe from Vegan on the Cheap and I can’t decide which one. So I’ll leave it to you to tell me. What kind of recipe would you like to see posted next? A soup or salad? Maybe a skillet dish, sandwich, or pasta recipe? Something for the slow cooker or oven? A dessert? Be as general or specific as you like — for example, you can ask for the recipe for one of the tester photos I’ve been posting these last few weeks. Whichever recipe (or type of recipe) gets the most votes will appear in a post by the end of next week. P.S. If you already have the book, you can "play" too -- list your favorite recipe so far or pick one that you think others would enjoy. 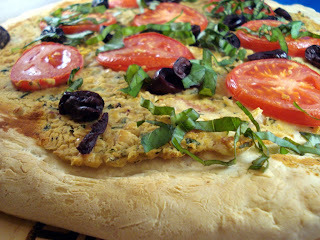 The stunning pizza photo was taken by Matt over at No Meat Athlete who recently blogged about my recipe for Tuscan White Bean Pizza from Vegan on the Cheap. 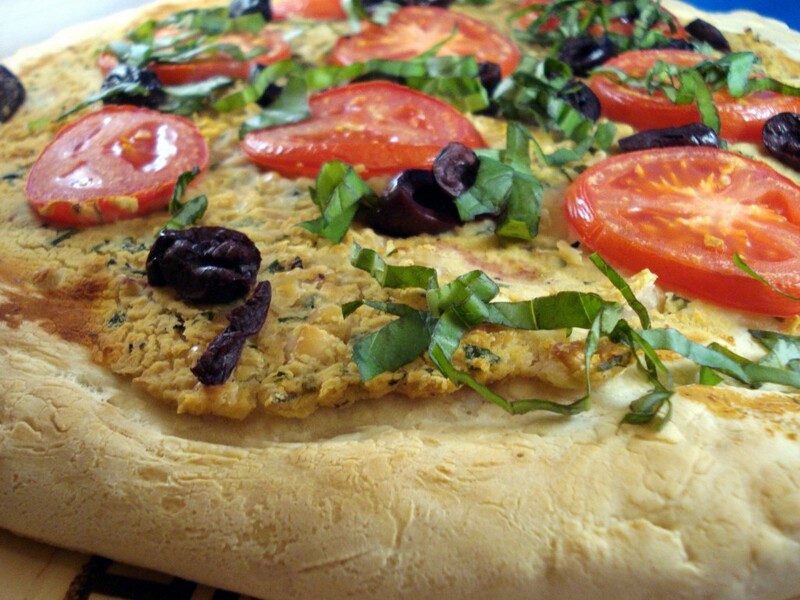 The main thing I like about this pizza recipe is that it allows you to enjoy a healthy and delicious pizza without the need for cheese of any kind. Sure, there are some tasty vegan cheese products out there, but they can be high in fat and expensive. Do you have any other great pizza ideas you’d like to share? Another gorgeous photo by Mackenzie Mollo posted on Vegan.com. This time, it's the Tiramisu Bread Pudding. A lovely notice on GoDairyFree.org. Thank you Alisa! And the Vegan on the Cheap cook-through over at Two Vegan Boys is still going strong. Great job, Krys! If you’re a fan of peanut butter and white chocolate, this post is for you. I confess to not having much of a sweet tooth, but when these little temptations are around, I usually cave. You can make them with regular semi-sweet (vegan) chocolate if you prefer and you can even use almond or cashew butter instead of peanut butter. They're all good. 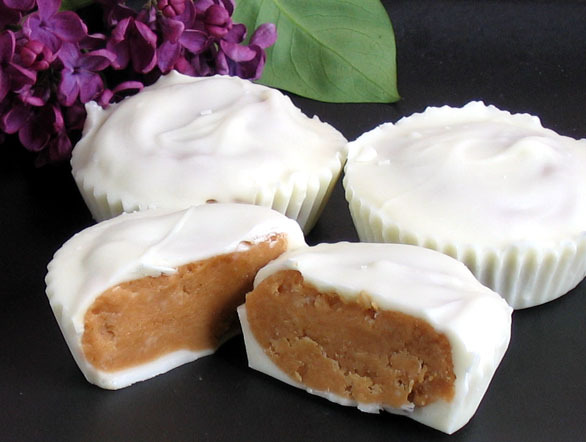 If you need an excuse to make these treats, they make a great “homemade” gift for Mother’s Day. Or you could just make some to celebrate Spring! 1. Melt the Earth Balance in a medium-size saucepan over low heat. Stir in the peanut butter and vanilla until well blended. Remove from the heat and stir in the sugar. Mix well until thoroughly combined, then refrigerate while you melt the chocolate. 3. Use a small brush to coat the chocolate over the bottom and about 1/2 inch up the sides of 12 paper cupcake liners. Refrigerate the cups until firm, about 10 minutes. 4. The peanut butter mixture should be firm. If it isn’t, incorporate a bit more confectioner’s sugar, a little at a time. Scoop out about 2 tablespoons of the peanut butter mixture and shape into a ball. Flatten the ball into a disc and place inside one of the chilled chocolate-lined cups. Repeat until all the cups are filled. 5. Spoon about 2 teaspoons of the remaining melted chocolate over the top of each cup. Refrigerate until firm. My latest food obsession is Cara Cara oranges. These sweet, luscious oranges may be old news to some of you, but they only recently showed up at my local supermarket. A type of navel orange, they look like other navel oranges on the outside, but once you cut into them, you'll notice the difference. The first clue that these are no ordinary oranges is their pinkish red color inside. The second clue is their flavor, as in "out-of-this-world sweet and delicious." Easily the best tasting oranges I've ever eaten, I enjoy them "as is" as well as in salads and other recipes. 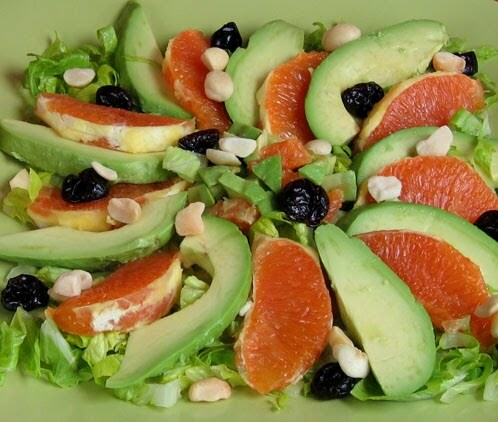 I made the refreshing salad in the photo above by arranging slices of Cara Cara oranges and ripe avocado on a bed of Romaine lettuce, sprinkled with dried cherries, macadamia nuts, and a splash of cherry juice blended with just a smidge of lemon juice and agave. The colors, textures, and flavors of this salad were simply outstanding. 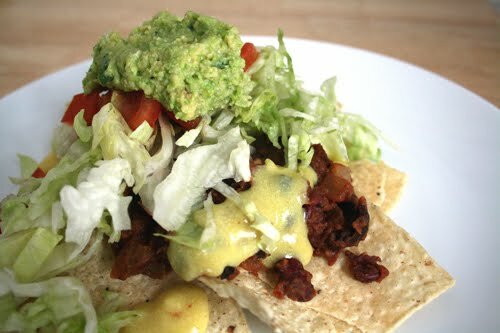 Article: Virginia Messina wrote a great article about Vegan on the Cheap for the Vegan Examiner. Cook-Through: Krys at Two Vegan Boys blog has decided to "cook through" Vegan on the Cheap. Follow her blog as she prepared every recipe in the book for dinner and then blogs about it the next day. Giveaway: If you still don't own a copy of Vegan on the Cheap, you now have five (count 'em, FIVE) chances to win a copy of the book at Vegan.com. (Hurry on over there, the drawing is on Friday!) Thanks Erik, for hosting this fabulous giveaway!